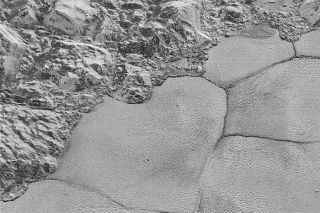 This Pluto image, captured by NASA's New Horizons spacecraft, shows the "shoreline" of the vast nitrogen-ice plain known as Sputnik Planum. This may be the closest we ever get to landing on Pluto. A new video takes viewers on a ride nearly down to the dwarf planet's surface, stopping just above the rippled "shoreline" of the vast nitrogen-ice plain known as Sputnik Planum. But this is no computer-generated experience. The video is composed of more than 100 photos captured over the course of six weeks by NASA's New Horizons spacecraft as it approached Pluto, and then, on July 14, 2015, flew within 7,800 miles (12,550 kilometers) of the frigid world's surface. "Just over a year ago, Pluto was just a dot in the distance," New Horizons principal investigator Alan Stern, of the Southwest Research Institute in Boulder, Colorado, said in a statement. "This video shows what it would be like to ride aboard an approaching spacecraft and see Pluto grow to become a world, and then to swoop down over its spectacular terrains as if we were approaching some future landing." The $700 million New Horizons mission launched in January 2006, on a mission to give humanity its first good looks at Pluto. The dwarf planet had remained cloaked in mystery since its 1930 discovery, so small and faint that the most powerful telescopes on and near Earth could not resolve it into more than just fuzzy blob. The images New Horizons got during its epic flyby have been a revelation, showing a stunning diversity of terrain that includes extensive ranges of water-ice mountains, flowing nitrogen-ice glaciers and other features. The probe's photos of Sputnik Planum show no craters, suggesting that the region's surface is extremely young — a big surprise, because scientists hadn't thought a body as small as Pluto could still be geologically active without some sort of gravitational intervention from a huge nearby body. New Horizons is still sending data and images from the flyby home, and will continue to do so through this October, Stern has said. The mission team is also gearing up for a Jan. 1, 2019, flyby of a second distant object known as 2014 MU69, which lies about 1 billion miles (1.6 billion km) beyond Pluto. New Horizons will conduct this additional flyby as part of a recently approved extended mission.